It's another MegaSpin game that will give you mega chances to win a whole lotta cold hard cash! Click here to play! As you may know, the MegaSpin slots are a unique take on classic 3 reel games. Players get to spin the reels on six separate 3 reel slots at the same time, giving you six chances to win! The theme of this game is lucky sevens and these numbers will pay out big if you can spin them across the single pay line of any of the six games. The colorful prism sevens are the top prize, paying out up to 2500 coins! Three red sevens will get you 240 coins, and a combination of the two will grab up to 120 coins. Also watch out for triple, double, and single BARS as well as cherries as these classic slot symbols will also bring in some pretty decent wins. This game takes a maximum of three coins, so be sure to bet them all to activate the highest pay table. That way you'll be rolling in the dough in no time. 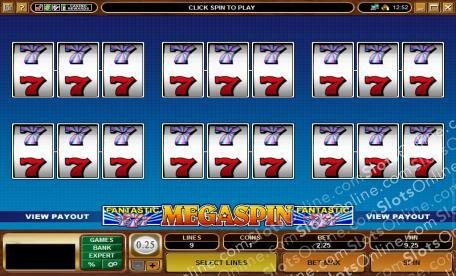 Play MegaSpin Fantastic Sevens for plenty of fun and cash!